Austrian Airlines reports its aircraft will continue to be visible in Canadian airspace this summer, even as codeshare partner Air Canada’s planes will be the ones physically linking Toronto and Vienna. Sherif Sedhom of the Lufthansa Group’s Toronto office told a recent Toronto gathering that plans call for Air Canada aircraft to be carrying passengers between the cities as of April 29. 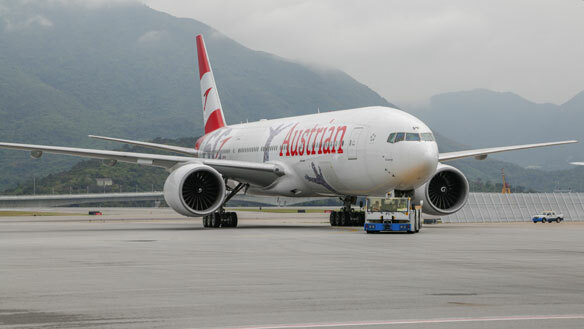 But he noted the same date will see Austrian Airlines travelling between Montreal and Vienna, with service reaching daily flights in the summer. Air Canada has decided to use a B787 Dreamliner on the Toronto route. The carrier has seven lounges at Vienna’s airport. He said the airline – which says it offers “The Charming Way to Fly” – has been said by authoritative Skytrax to offer the best airline staff service in Europe for five straight years. Austria’s musical heritage was repeatedly referenced during the gathering, with Pablo Bolanos of Vienna’s Mozart Orchestra saying tourists can visit “places where the history” of music was made. Vienna’s musical scene is underscored in part by its famed waltzes. Austria’s Toronto-based consul and trade commissioner Christian Lassnig noted Salzburg is another city synonymous with music, among other things being the setting for the movie The Sound of Music. Other Vienna attributes include its being home to 200 castles and palaces and 100 museums. The audience also heard that Austria’s westernmost state of Vorarlberg, in turn, has the highest mountains in Austria and offers numerous outdoor activities, such as hiking during the summer.